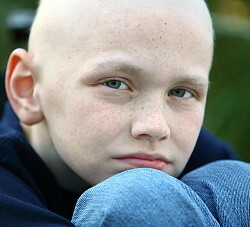 Osteosarcoma is a very rare cancer that often strikes children, adolescents and young adults. Was this story an encouragement to you? Let Truman and his family know - sign his guestbook! Truman was 9 when he was diagnosed with osteosarcoma at the femur. His treatments included chemotherapy and amputation. Inspiration comes in many forms to many people. The suffering of your innocent child and the journey through childhood cancer will cause inspiration to creep over you like a fog. It is a gift my son did not want or ask for, yet it is the gift chosen for him by God. Truman, my son, has the gift of inspiration. It is his amazing spirit that has held our family together by silk threads during the last four years. He has helped to push us all forward and has inspired me to push him when he can no longer push himself. When describing Truman, there is always so much medical talk, yet he is so much more than his medical position in life. He is a creative thinker, a talented artist, a caring friend, and he wants to be a marine biologist and have a life on the sea. He loves nature and all of its creatures, especially the Orca whales. He likes video games; he likes visiting his cousins; he is an excellent student; he is funny, charming and beautiful...he is so much more than a hearing-impaired amputee. Truman was diagnosed with high-grade fibroblastic osteosarcoma at the age of 9 (after just completing 2nd grade in June 2009). He had a huge tumor inside his right femur that started at the distal end and extended up inside his femur for 17 centimeters. From what I have seen and read, this is a staggering size. Our life halted on the day of diagnosis, and pure hell began for our family. We also have another young son who was 6 at that time. 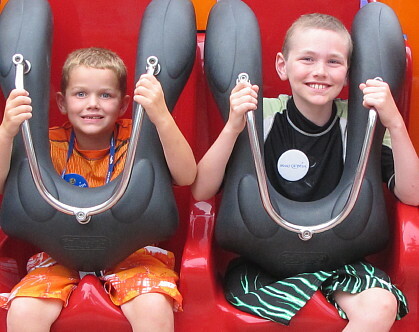 How do you tell your 6 and 9-year-old sons that your 9-year-old has an often fatal cancer? It is something that will tear your heart out. Truman had no lung metastases at diagnosis. After the flurry of activity for the open biopsy, the port implant surgery and meetings with many specialists, he began chemo in July 2009. His sweet body was decimated by the chemo of the MAP Protocol. Three drugs (Cisplatin, Doxorubicin and Methotrexate) would be delivered straight into his port for almost a year, in the hopes they would kill the cancer. These drugs are awful poisons to healthy cells and they quickly begin their destruction of everything in their path in his body. Truman went from 70 pounds to 50 pounds, and fevers were ever present. We spent very close to a solid year in the hospital, and mouth sores ruled our lives. The days were dark and lonely, as he wasted away and our family tried to hang on. We were unaware of how much worse it could be until we researched treatment options for removing the cancer. 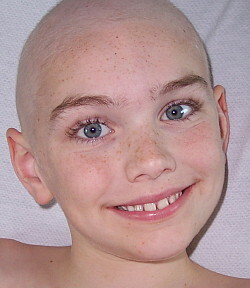 Osteosarcoma must be surgically removed or certain death will occur. On October 29th, 2009, for a chance at life, Truman bravely and courageously underwent the amputation of his right leg above the knee at Houston's M.D. Anderson Cancer Center. That was and remains a day that leaves me broken in so many ways. Our life and Truman’s life after amputation, with seven long months of chemotherapy still to go, would continue to tumble into the darkness. Our precious 9-year-old gave up his right leg above the knee, and no one in our family would ever be the same. 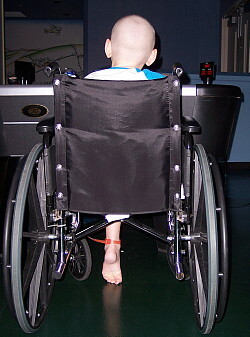 Truman lost who he was in the remaining months of treatment. Our family was losing the emotional battle, and our youngest son lost his running buddy in life. Those days after amputation were the darkest of all the days in this fight. 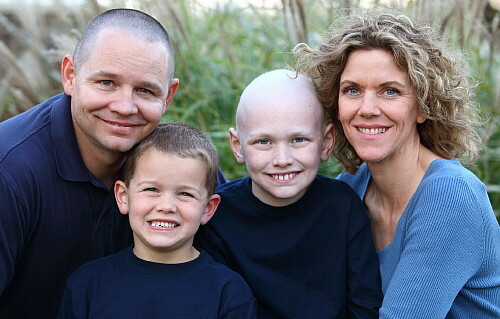 Truman completed chemo in late May 2010 and was declared to be NED (No Evidence of Disease). No one felt like celebrating, as the treatment had robbed him of so much. Since Truman completed treatment, we have had repeated scares on the scans with suspicious spots in his lungs. Due to a lack of recovery of his platelets, his oncologist feared he was developing chemotherapy-induced AML, which thankfully did not occur. His platelets have remained below normal for more than three years and have just hit the normal range in the last four months. What this cancer has done to our sweet son and family cannot be put into words. We suffered the loss of three children at our hospital due to childhood cancer immediately upon being admitted, and as the months of chemo began, the fear was paralyzing. In addition to those three children, we have gotten close to two families only for them to suffer the immense grief of losing their beautiful children as well, both to osteosarcoma. All of this is known to Truman and not hidden in any way from him. He must know the truth, but he must also have hope. The psychological damage to Truman has been great. He has also suffered substantial hearing loss from the chemotherapy (Cisplatin) that requires the use of hearing aids all the time and an FM system at school. We feel like we were greeted with, "Welcome to Cancer Land. We will take your son's hearing and his leg, and he will see and feel the deaths of many young ones just like himself. And he is just 9...now sink or swim." 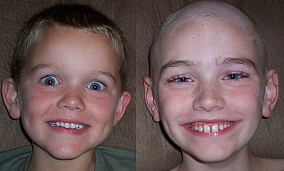 The general public has no idea of the horrors of childhood cancer and the devastation it levels on precious families. How does your child make it through and thrive again? How do parents survive the death of their precious child? And how do the siblings who are left in the aftermath of its rage move on without their brothers and sisters, or with a dramatically different life? As his mom, I don't think that I will ever recover from what I have seen and felt. 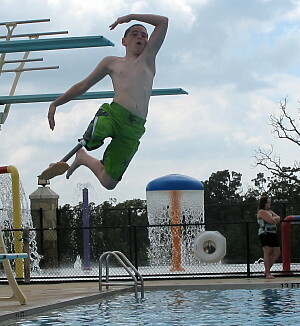 Yet, after all of this….here Truman is now, at the age of 13 and in 7th grade (after missing all of 3rd grade originally). He is making straight A's and smiling and laughing with good friends. He is happy again (with ongoing support) and continuing in his recovery, both physically and emotionally, as he lives as a young amputee. He has learned to walk, run and ride a bike. He has competed in the Endeavor Games for physically challenged athletes; he has inspired a community and given our family hope again. Each milestone he accomplishes as he goes through the day-to-day of his life strengthens those fragile silk threads that hold us together as a family. I don't think the fear of those follow up scans will ever leave us. I am scared to death every time, and we have had some real heart-to-heart talks with the surgeon and doctors about what we are seeing on them. We have had emergency trips to Houston from Tulsa (8 1/2 hour driving time) and procedures that were awful. Yet today, I am blessed to take my son to school this morning...blessed that he is still with us and he smiles and laughs. Almost everything is different now in our family in so many ways, yet some things are still the same. There is an underlying uneasiness that wasn't there before cancer. Every day, Truman puts on his leg and goes out to conquer the world as a 13-year-old now. Our youngest son, Greyson, is now a year older than Truman was when he was diagnosed with cancer. He dearly loves his brother and has learned to live with a young amputee. Their interactions are filled with jokes and laughter and love. We have become experts on prosthetics and the needs of amputees, and our medical knowledge has shot through the roof. We know how to write IEP's for school and demand action and get results for what he needs at school. We live in a caring community where most know his story and want to help. The mouths that used to drop open when they would see a very frail, bald headed, one legged boy in a wheelchair have given way to smiles when they see a young boy who looks healthy with hair on his head, running with a prosthetic leg, or walking with a friend at school. Being an amputee is not an easy task; there is absolutely nothing about it that is easy in any way, yet Truman is four years out from his amputation anniversary and walking every day. 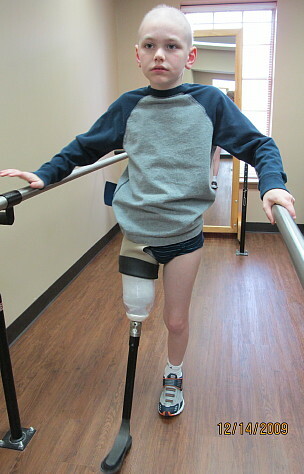 He grows a bit now and then and tries new prosthetic feet or new gadgets, not yet big enough for any computerized knees (like the C-Leg or Genium). We pray that one will be in his future. 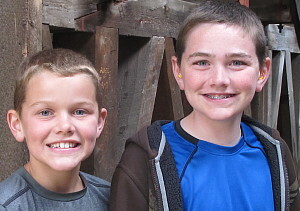 We are raising two young boys, ages 10 and 13 now, so we are busy a lot with school, extra-curricular activities, sports and medical appointments (lots of them). We still have a lot of issues that we deal with and work on and get help for, and it seems as if we are at the oncologist, audiologist, or prosthetist at least 3 times a week. Managing everything is a full time job. 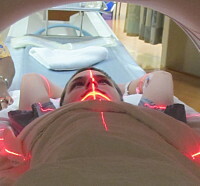 We must travel back and forth from Tulsa to Houston regularly for continued follow up and scans. I hang my hope and hurt at the cross. Some days are very difficult and sadness prevails for him and me and our family, and our youngest son has suffered tremendously as well. But most days are filled with smiles and laughter. Yet we know how fragile that laughter is, that life can turn on a dime and chaos could reign again. It is a known recurrent cancer and we know that his NED (No Evidence of Disease) status is fragile at best. I feel that we almost didn't survive that year of chemo and amputation; our family was almost lost, the hurt so deep, the pain so large, and the dark hole we were in has taken many years to try and climb out of and find happiness again. Yet even in all our sadness and hurt, we know that the pain can go so much further. We have seen the destruction of dear families and it leaves you empty and hurting. To know how we feel and then to see that happen, we can't even imagine that grief of losing your child to this cancer, so far beyond what we already feel. We pray so deeply for those sweet families and their beloved children and surviving children. It is a cruel disease as no one seems to know why some live and not others, what is the magic that will spare your child....if only we knew. This is what brings me to the cross every day, just to have gratefulness for where Truman is. None of my gratefulness lessens in any way what Truman has been through and what he must deal with on a daily basis for the rest of his life, or the fear that still grips us if he coughs or complains of pain. Many, many nights I have lay awake beside my son and wept as he slept. My heart was so broken that many times my prayers were just garbled sobs, I didn’t have any words. I would lay my bible on my chest and sleep with it on my heart, my way of communicating with God when I had no more words. Now the only way that I can cope is to be his best medical advocate possible, seeking answers and questioning everything to know that we are doing everything humanly possible to attain the best possible outcome, and the rest must lie at the cross for me. For in my heart I know that even the best medical cannot change what is God's plan for Truman, and I am not capable of understanding it. Please have hope in these dark times. The year of chemotherapy and surgery is very, very difficult. If you find yourself in these circumstances, do everything you can to become as knowledgeable as possible. Let your friends and family help with food and siblings and housework - they need to feel like they are helping, as everyone has such a hopeless feeling in the middle of this. There are many on the ACOR list who will answer questions and who have walked this road many times over. I am very grateful to the prayers from the list, the knowledge that is freely shared and just to know that you are not alone in this fight. We know wherever you live locally it feels as if you have just entered hell alone and he wants to take your child. Love each other; stay strong together; cry together; research the cancer and treatments and side effects. Keep your child connected to his or her school and as many friends as you can. Pray together; try to smile and laugh when you can. Be tough as nails in this fight. There are many survivors who are over five years out and doing wonderfully, and it is those who inspire me to keep pushing for Truman, to keep fighting. Once the chemotherapy is over, there is still a large fight....but it is the fight for your sanity, for your family when the physical abilities of one member are dramatically changed. It is the financial fight to not drown in all the medical bills and the fight for happiness again that will push you forward. It is the fight over fear that will allow you to smile and laugh again, to be grateful and to try and enjoy each day. Not every day will be great, this is the reality, but now you have the knowledge that it can be so much worse. That knowledge will allow you to move ahead, positively, loving each other and holding firm in life. Truman has conquered so much and God has blessed him with an overcoming spirit. He is loved beyond measure...both of our boys are. Signatures in Truman's Family Guestbook will appear here. Please share your thoughts! Thank you for sharing your son's story..my daughter was diagnosed with osteosarcoma last month, she's 9 year old, she's done with the first session of chemo...it's very painful as a mother seeing your child lost her appetite, can't play, can't do her normal activities..can't help but cry when I am alone, I dont want her to see me crying, I need to be strong for my daughter...I know God has better plan for her, I believe this trial will pass...My daughter is stronger than me, I thank God for giving her enough patience and making her strong and fighter...God is with us, let's not lose hope and let's show to our children that we are always there for them no matter what...we're not alone in this battle..God loves us and heals.. Your honesty and openness hit home to me, as our son too was dxg. with osteo on Jan.25, 2012. We will never forget that day, and how it changed our lives forever. My son is with us today, but like most, he suffers from after affects, and pain and mobility issues on his arm. We are grateful he is here with us, however our lives will never be the same. We live one day at a time, all the while cautiously smiling and laughing, as we know what might be lurking around the corner. prayers to you and your wonderful family. Big love and warm hugs to you and your family Kim. Your piece was so beautifully written and captured the intense, brutal rollercoaster of events and accompanying emotions that accompanied Truman's diagnosis and treatment. my name is Clotilde and I live in Italy. My daughter Bianca, 10 was diagnosed this Summer with a Ewing Sarcoma at her left limb. I read your story and couldn't help to keep my tears and emotions going everywhere. You put in words what my family is going through right now, the good and the hard feelings that we were suddenly confronted with. Thank you so much for sharing your story, it's a light at the end of this dark tunnel for many of us, that are still walking the path. My name is Katie Arens, my son, Peyton, was diagnosed with Rhabdomyosarcoma on January 25th, 2013. As a Jenks Southeast family, we hoped and prayed for Truman throughout his journey. Your strength and faith in God is such an inspiration to us. I was one of those people who never thought about childhood cancer much until Truman's diagnosis. Then our life changed forever when Peyton was diagnosed. Thank you for sharing your journey and giving us strength to help Peyton fight his battle. We will continue to pray for Truman, his continued remission, physical challenges and for your entire family. Copyright © December 2013 Liddy Shriver Sarcoma Initiative.